The migration of Muslims against the background of globalization and conflicts in the Middle East, and the threat perceived by the Christian or non-religious majority population, highlight how the peaceful coexistence of different cultures and religions is in danger. In March 2016, Slovak elections highlighted the ugly manifestations of Islamophobia. Most troubling was the popularity and rise of the right-wing extremist and right-wing populist party Kotleba – People’s Party Our Slovakia. The following article poses two research questions. First, to what extent did Islamophobia influence the 2016 elections? And, second, is the level of Islamophobia in Slovakia an accurate indicator of public sentiment, or instead part of a larger feeling of discontentment among the public? This article will use theories of post-factual politics from the field of political science. Empirical evidence in qualitative and quantitative forms of analysis will be presented, as well as the types of narrative constructed and observed within the Slovak media. The increased migration of Muslims against the background of globalization and conflicts in the Middle East, and the threat perceived by the Christian or non-religious majority population, highlights how the peaceful coexistence of people of different cultures and religions is in danger. As a trained political scientist working within the field of International Relations, the author has observed an increase in violence, and a mentality as well as a rhetoric that are harmful to liberal democratic traditions. Both political science and international relations are widely discussing and researching migration and the domestic challenges that it poses within the post-factual 2018 political landscape. Moreover, by taking a theoretical approach, I hope to provide useful information and evidence for professionals from other interdisciplinary approaches. Since 2015, negative attitudes towards Islam and Muslims have been very common in certain Eastern European countries and have led to political demands that are incompatible with the democratic requirement of religious freedom and EU anti-discrimination laws. In March 2016, Slovak elections highlighted the ugly manifestations of Islamophobia. At the level of attitudes, behaviours, the media and political context, the 2016 campaign should have focused on the economy, tackling corruption, and providing an opportunity for the incumbent political party and prime minister to remain in power. Instead, it was dominated by the so-called refugee crisis. The various political parties spoke on this issue, often revealing negative attitudes towards Islam and Muslims. The Slovak media added an additional context and focus by stressing the incompatibility of Muslim refugees in Slovakia. Social media like Facebook revealed that anti-Islamist sentiment was very popular. Additionally, and most troubling, was the popularity and rise of right-wing extremist and right-wing populist individuals such as Marian Kotleba, leader of the far-right Kotleba – People’s Party Our Slovakia, which finished fifth in the 2016 national elections and now holds 14 of 150 parliamentary seats. The perceived threat of Islam, both in their core programme and as part of their general xenophobic orientation, attracted and attracts supporters. An example of this are unproven (post-truth) factual stories posted by the Slovak blogger Denník N, which has malicious and hateful comments of an Islamophobic nature. The terrorist attacks in Paris and Brussels had a significant impact on Slovak public opinion in terms of Islamophobic statements, with Prime Minister Robert Fico and like-minded politicians and media activists arguing that “Islam is not compatible with our culture”. Equating Islam as a religion with the phenomenon of terrorism intensified this issue within the context of the refugee crisis, which was used during the 2016 Slovak parliamentary elections. A further manifestation of Islamophobia can be observed in the media that serves the public. Rather than presenting positive information on inter-faith cooperation between the Islamic community in Slovakia and other Christian denominations, or the benefits of coexistence, the media presents negative stories of Islam that make people afraid of the religion. Rather than presenting real and factual stories, the media associates Islam with terrorism and public unrest. Mainstream Slovak TV stations, radio, newspapers, websites, and other sources of information focus on Muslim extremist actions that are often perceived as sufficient reason for general condemnation of Islam by readers, listeners and viewers. The Pegida demonstrations in Dresden that attracted 8,000 people in the wake of assaults on women in Cologne on New Year’s Eve in 2016 were reported by the Slovak media, but in a way that suggested that the demonstrations were acts of anti-terrorism. As the European migrant crisis continues, the attitudes of EU citizens towards ethnic minorities continue to shift and evolve. Although discrimination clearly remains widespread in some regions, the majority of respondents also agreed that new measures should be introduced to protect visible minorities; while this is surely encouraging, Islamophobia is, as the map below clearly shows, at its strongest in the EU in Central Europe and especially in Slovakia; thus, the Slovaks are the most Islamophobic and racist population in the EU. (see Figure 1). Xenophobic groups use people’s fear of the unknown to stir up trouble, and this is what we are witnessing in Central Europe, and particularly in Slovakia with the rise of a far-right political party. Therefore, two research questions emerge: 1. To what extent did Islamophobia influence the 2016 elections? 2. Is the level of Islamophobia in Slovakia an accurate indicator of public sentiment, or instead part of a larger feeling of discontentment among the public? This paper will use theories of post-factual politics to describe how the Slovak election in 2016 was framed according to emotional appeals disconnected from policy detail. The key difference between the post-factual and the traditional contesting of facts lies in how the former downgrades facts and expert opinion because it is interested in emotional appeal. In recent years, post-factual politics has been viewed as a contemporary problem, as something that has arisen in, for example, the US, the UK, and Russia. Driving factors are also the combination of the social media and its ubiquity, 24-hour news and more often than not a false balance in news reporting. Jennifer Hochschild, professor of government at Harvard University, has described this rise as a return to the media practices of the eighteenth and nineteenth century. While the Internet and the World Wide Web were widely heralded in the 1990s as beneficial to democracy because they would now make information accessible and cheaper, and allow the public to participate in areas that they were previously excluded from, developments in social media in the 2000s accelerated this trend. Mass mobilization allowed various national publics to bypass oppressive authoritarian state control and fuel popular revolution, as in Ukraine and Egypt. However, negative information has also flourished. Authoritarian regimes have responded either through censorship (China) or by spreading negative information through social media trolls and bots (Russia). This was on display in the US presidential election of 2016. Moreover, it is increasingly difficult in the marketplace of ideas to counter negative information. Put simply, all possible sources are viewed as credible. As Russian-British journalist, TV producer, and writer Peter Pomerantsev wrote in the British cultural magazine Granta, “the digital disruption of the traditional media and traditional journalism – the collapse of newspapers, the flight from flow TV news, and the wildfire success of new media like Google, Facebook, Instagram and Twitter – not just fragments the news stream and creates algorithm-supported echo chambers, where people on the basis of their internet behaviour increasingly only are confronted with opinions and worldviews they already agree with”. Once it has been accepted that knowledge is a type of power – undemocratic and illegitimate – “then the liberation that postmodernism inherited as a project from the Enlightenment quickly turns into a wholesale rejection of facts, arguments, knowledge and the associated institutions. … liberation must be looked for through feelings and the body, which are revolutionary per se. … [and this philosophy] has seeped down from universities, out into media, advertisement agencies and the communication industry – and from there into politics. It is a worldview where every version of events is just another narrative, where lies can be excused as ‘an alternative point of view’ or ‘an opinion’, because ‘it’s all relative’ and ‘everyone has their own truth’”. While the term “post-truth politics” was coined by the blogger David Roberts in a blog post for Grist on 1 April 2010 to denote “a political culture in which politics, specifically public opinion and media narrative, becomes disconnected from policy”,  it is in fact not new. Indeed, the term was first used in a 1992 essay by the late Serbian-American playwright Steve Tesich in The Nation. Tesich wrote that, following Watergate, the Iran-Contra affair, and the Persian Gulf War, “we, as a free people, have freely decided that we want to live in some post-truth world”;  Ralph Keyes used the term “post-truth era” in 2004 in his book by that title;  and Colin Crouch used the phrase “post-democracy” in 2004 in his book Post-democracy to refer to a model of politics where “elections certainly exist and can change governments”, but where “public electoral debate is a tightly controlled spectacle, managed by rival teams of professionals expert in the techniques of persuasion, and considering a small range of issues selected by those teams”. Academic writing on this subject may be found in Wendy Brown’s 2006 research article “American Nightmare: Neoliberalism, Neoconservatism, and De-Democratization”;  Michael Peter’s 2017 editorial “Education in a post-truth world” in the Journal of Educational Philosophy and Theory;  Hunt Alcott and Matthew Gentzkow in their article “Social Media and Fake News in the 2016 Election”. These sources and the theoretical background help explain the post-factual reality of the Slovak parliamentary elections. The Slovak parliamentary election in 2016 saw the use of post-factual reality. The use of emotional connection, i.e. fear of Muslim immigrants, was on full display and was packaged within the narrative of security. Furthermore, Slovaks hold similar opinions to the Czechs and Poles. The then-Prime Minister Robert Fico echoed Czech President Miloš Zeman’s comment that the Czechs would not welcome Muslim immigrants into the country; he also echoed the sentiment expressed in Poland that the country would be willing to accept only Christian refugees, with Fico justifying this by saying that there are no mosques in Slovakia. The Slovak election saw the use of microtargeting in the media landscape, as well as of tabloidization. Despite there being no terrorist threats, and despite the presence of a very small Muslim population that had been assimilated into Slovak culture and society since the 1970s, there was a fear of Muslims. The effective use by a far-right extremist political party, Kotleba-Ľudová strana Naše Slovensko (Kotleba-ĽSNS) drew comparisons to Slovakia’s fascist history. The party, Kotleba-ĽSNS, was often referred to as the dark horse of the election. The fact that it performed better in actual votes than mainstream political parties surprised members of the media, international commentators, and scholars. The additional fact that some Slovak political parties with established political histories were unable to reach the 5% threshold to enter parliament is something that political pundits and academics in Slovakia will explore and debate for a long time. Issues that fuel fear and hate, coupled with harsh rhetoric, are often precursors to extremism. “Extremism is fertile ground for radicals and the challenges for democratic forces”. Despite the fact that Kotleba-ĽSNS, was not visible as a political party in public opinion research in the months preceding the election, it managed to reach the electoral threshold and thereby gained seats in parliament. The success and popularity of Kotleba-ĽSNS are based largely on identity politics. Politically constructed identities signify a wide range of political activity and theorizing founded on the shared experiences of injustice of members of certain social groups. Rather than organizing solely around belief systems, or party affiliation, political formations usually aim to secure the political freedom of a specific constituency marginalized within its larger context. Members of that constituency assert their distinctiveness with the goal of greater self-determination. Kotleba-ĽSNS – and, to a larger degree, Slovakia, too – has moved from full normative conformity with the West to an attitude that is rather ambiguous. A few Western principles and norms are accepted unconditionally, while others have been subverted or rewritten in political discourse. For the purpose of this article, Laclau and Mouffe’s discourse theory is used as an analytical tool to understand the 2016 Slovak parliamentary elections. However, no Slovak political party had more success than Marian Kotleba and his party in using the negative mood of the Slovak electorate, and in using new media such as Facebook for political marketing. Arguably, there is a direct link here to Foucault, and his discussion of social power struggles, and how historical forms of discourse have been shaped. Distancing itself from mainstream parties and distinguishing itself by embracing rhetoric and supporting policies highlighting the difference between Slovakia and the ‘Other’ were simple and concise. Such elements were present on Kotleba-ĽSNS’s campaign pillars and in its campaign manifesto. In using the fear of the other, i.e. immigrants, Kotleba-ĽSNS took advantage of an issue that the mainstream media and mainstream political parties were using as well. The immigration topic was a useful tool for all the parties, but it held more resonance for Kotleba-ĽSNS as it argued that it was the party that would truly protect Christian Slovakia..Kotleba-ĽSNS also used popular anti-establishment sentiments to its advantage. 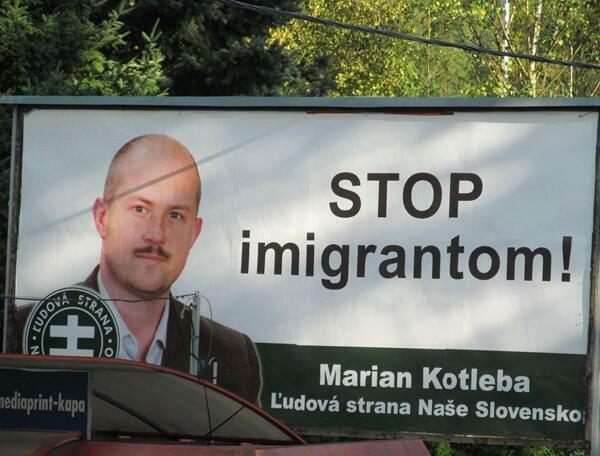 Referring to Slovak members of the European Parliament (MEPs) as traitors who had voted in favour of the EU migrant quotas, Kotleba-ĽSNS played on Slovak citizens’ sensitivity on this issue with the simple slogan, “Stop Immigrants!”, as shown below (see image 1). The issue of migration and of the Roma community, both sensitive issues for Slovak voters, were at the centre of the campaign. Since Kotleba-ĽSNS was absent from the mainstream coverage of these issues and from the responses of the mainstream Slovak political parties, the party was able to dominate the narrative in its answers online. And, although the answers offered by Kotleba-ĽSNS were unrealistic and simplistic, they nevertheless resonated with the Slovak voter. This was not simply a case of uneducated voters and easy appeal. The explanation offers a direct link to ethnonationalism. Political parties in Eastern Europe have a historical predisposition towards ethnonationalism, which affects the discursive strategies adopted by competing political parties. Mainstream political parties often co-opt certain messages and rhetoric used by the far or radical right to win additional votes. It is no surprise, then, that this is what occurred in Slovakia. Kotleba-ĽSNS was successful in creating the dominant discourse on social media, mainly Facebook, which is followed more than television and the print media in Slovakia. Kotleba-ĽSNS had 70,000 followers by 1 March 2016. Populist rhetoric and actions are not new tactics. Months before the election, Prime Minister Fico and his party, Smer, distributed large welfare handouts, and Smer built its campaign solely on protecting Slovakia, but failed to differentiate itself from Kotleba and other competitorsn. Moreover, Fico was unable to channel the anxiety that he had helped to create. But the most effective messages that Kotleba-ĽSNS disseminated were opposition to migration and what the response to the migration crisis should be. Exit polling showed a high percentage of young first-time voters. Focus polling agencies showed that 17.3% of Kotleba-ĽSNS voters had never voted before. If this percentage is applied to official election results, Kotleba-ĽSNS received around 209,000 votes, with approximately 36,000 votes from first-time voters. In comparison, the Freedom and Solidarity party (SaS) received around 21,000 votes from first-time voters aged 18-21. Kotleba-ĽSNS also received the majority of votes from manual labourers and former supporters of the government party, Smer. In exit polling, 8% of voters said that they had voted for Kotleba-ĽSNS solely on the basis of the issue of immigration. Zuzana Kusá, a sociologist with the Slovak Academy of Sciences, told the Slovak Spectator that “Kotleba’s party in parliament is the result of chronic social and economic insecurity, lack of perspectives, and a chronic lack of integrating values in our society”. Moreover, after the elections, the Data of Statistics Office showed that Kotleba had received support in almost all districts in Slovakia and had attracted between 6 and 13% of voters, which is enough to enter parliament. Tibor Madleňák stated: “This reflects the broad support that the party got: first-time voters, protest voters, and former non-voters who are relatively equally present in most regions”. The issues discussed on the Facebook page of Kotleba-ĽSNS and the rhetoric used by Marion Kotleba pushed the boundaries of both the law and normative values. A key example of this boundary pushing was organized marches with party members wearing uniforms resembling the uniform of the Hlinka Guard, a wartime fascist organization. The DEREX (Demand For Right-Wing Extremism) Index, which surveys prejudice, reports that over 10% of the Slovakian population supports right-wing extremist groups. . Since the introduction of social media sites such as Facebook, Twitter, and Instagram, political parties and candidates have tried to use such media to their advantage. This is important when mainstream media outlets do not offer visibility in the modern era to certain political parties or candidates. What is also important for far-right political parties is that social media has become a very useful tool to target specific voters through online campaigns. Such targeting offers the opportunity to radicalize people, something that has been explored by Behr, Reding, Edwards and Gribbon in Radicalization in the Digital Era,  by COPS in Online Radicalization to Violent Extremism,  and by Helmus, York and Chalk in Promoting Online Voices for Countering Violent Extremism. Moreover, these new forms of media attract mainstream media attention  and enter the public discourse. Analysis of the media coverage given to Marian Kotleba and to his party during the time period analyzed (from 1 January 2016 until the day of the election on 5 March 2016), shows that his visibility was 19 times greater than that of his own political party: there were 831 media messages on Marina Kotleba and 43 media messages on ĽS-NS. Despite this difference, there were also similarities in media coverage. One fundamental similarity was that both candidate and party were more visible online via social media than they were in the mainstream Slovak media. This also applied to the variety of media formats and to the type of coverage (national or regional coverage in print, online, or on television), with Kotleba receiving 72% or 600 media messages as opposed to ĽSNS, with 36% or 36 media messages. Additionally, media coverage varied, from drawing attention to ĽSNS candidates to promoting the main pillars of its electoral manifesto. Promotion of the party and its views was conducted through alternative methods, such as a party newspaper and online. And, while there is no statistical evidence that the media coverage helped Kotleba-ĽSNS to achieve such positive election results, there is no doubting the power of online media. The 2016 parliamentary elections saw the use of ethnocentric discursive strategies and cultural othering across the political spectrum, although Slovakia is the least homogenous country in the region, with Hungarians comprising 9% of the population and the Roma comprising between 2 and 10% (depending on the survey). However, ethnocentric discursive strategies and cultural othering were certainly not the preserve of the radical right, or indeed of right-wing parties, as recent scholarship on far-right parties in the region has shown. What is perhaps most intriguing is how the Slovak National Party, once viewed as extreme and which has actively exploited anti-minority sentiment, despite its participation in the first Fico government (2006-2010), had by 2016 been rebranded and was viewed in contrast to Kotleba-ĽSNS as a mainstream party in spite of its anti-Roma, anti-Hungarian ethnonationalist views. While both Kotleba-ĽSNS and SNP effectively used the migration crisis for political capital, what is disturbing is the fact that, after the elections, these two radical right-wing parties with ethnonationalist views control nearly one-fifth of the seats in the Slovak parliament, with the party again a member of the ruling coalition and its party leader, Andrej Danko, holding the position of parliamentary speaker. In addition, the 2016 campaign saw other political parties such as Smer and SaS co-opt similar ethnocentric positions as part of their discursive strategy, and were aided in doing so by the Slovak mainstream media. This legitimizes the arguments of an extreme party such as Kotleba-ĽSNS, and, in the case of Smer, saw its leader and Slovakia’s current prime minister, Robert Fico, exploit the migration crisis in a way that conflicted with the mainstream discourse of Western Europe and of European leaders in Brussels. Fico stated his ethnocentric position in comments that he made in January 2016 when he offered a culturalist, or rather a culturally particular, interpretation of identities that conflicted with Western universalist principles from which obligations towards refugees derive. Fico’s criticism centred on the European ideology of multiculturalism. “The idea of multicultural Europe failed”, he declared in January 2016, “and the natural integration of people who have a different way of life, way of thinking, cultural background, and most of all religion is not possible”. Moreover, on the issue of religion, Fico argued that the formation of “compact Muslim communities” in Slovakia would breed security risks similar to the 2015 terrorist attacks in Paris. Such a culturalist vision with an emphasis on religion was effectively used for the domestic audience as the Slovak government initially agreed to accept a small number of Christian refugees because, as it was pointed out, Slovakia was a Christian country and therefore could not tolerate “an influx of 300,000 to 400,000 Muslim immigrants who would start building mosques all over the place”. While Slovakia’s political establishment did not participate in the Western European discourse, and instead promoted its own vision of European identity, the way that it framed issues such as the migration crisis did promote Slovakia’s vision of European identity. Robert Fico used the slogan effectively, coupling it with simple statements that touched on the security threat for Slovaks, or on the fact that the security of Slovaks had a higher priority than the rights of migrants, or on the fact that the government monitors Muslims. As a result, Smer had increased its percentage by seven points in opinion polls by the end of 2015, clearly confirming that such a confrontational approach paid political dividends. The migration crisis offered new opportunities for political othering; an understanding of Europe as a Christian civilization in need of protection from cultural threats does signal a less inclusive stance. Such a conservative vision upholds the idea of Europe but the idea of Europe that it upholds is different. In terms of immediate practical policy, this is a selective choice, enjoying the benefits of EU membership without fulfilling all its requirements. Furthermore, as to identity-building, ethnocentrism is a step away from normative conformity, but a step towards something else, perhaps partial identification and subversion. Finally, this approach is surely negative for Slovak domestic politics as it opposes EU unity on shared issues, and undermines Western values. The 2015 migration crisis influenced the Slovak parliamentary elections in March 2016, and the responses to the crisis changed the political landscape. Alternative media, and in particular social media, are powerful tools to reach the voter. Populist candidates will always find an audience receptive to their message. Kotleba-L’SNS took that populist message and combined it with its anti-immigrant, xenophobic, and homophobic rhetoric. Finally, post-truth politics as a political culture forces debate framed largely by appeals to emotions disconnected from the details of policy. Sadly, this is what we observe in Slovakia on the issue of Islamophobia. As to the extent to which Islamophobia influenced the 2016 elections, the answer is arguably that Islamophobia played a role in motivating voters to vote for a racist party. Also, mainstream Slovak parties were assisted by co-opting ethnonationalist sentiment. As to the second hypothesis, it is less clear. With regard to the parliamentary elections, it can be argued that Islamophobia was part of a larger wave of public discontentment and therefore not an accurate indicator. However, polling from the European Commission-Public Opinion  indicates that Slovak public sentiment is clearly Islamophobic. Furthermore, Amnesty International has criticized the public discourse surrounding refugees from the Middle East and North Africa,  and illiberal groups display an increased ability to organize themselves and mobilize citizens, most notably young voters. The fallout from the refugee crisis continues to fuel discriminatory sentiment. Tomáš Pilz: Sulík bez servítky: Islam nie je kompatibilný snašou kultúrou, Parlamentné listy, URL: http://www.parlamentnelisty.sk/arena/monitor/Sulik-bez-servitky-Islam-nie-jekompatibilny-s-nasou-kulturou-275050 [13.09.2017]. Enis Bayrakli, Farid Hafez: European Islamophobia Report 2016. SETA, URL: http://www.islamophobiaeurope.com/wp-content/uploads/2017/03/SLOVAKIA.pdf [08.08.2017]; ČTK: Na demonštráciu Pegidy v Drážďanoch prišlo 8-tisíc ľudí, Správy.Pravda.sk, URL: http://spravy.pravda.sk/svet/clanok/382596-na-demonstraciu-pegidy-v-drazdanochprislo-8-tisic-ludi [06.02.2016]. New Scientist, Free speech has met social media, with revolutionary results, URL: https://www.newscientist.com/article/mg23030763-000-free-speech-has-met-social-media-with-revolutionary-results/ / 01.06.2016. Christina Pazzanese, Politics in a 'post-truth' age, URL: https://news.harvard.edu/gazette/story/2016/07/politics-in-a-post-truth-age [06.08.2018]. David Roberts, Post-Truth Politics, URL: https://grist.org/article/2010-03-30-post-truth-politics [16.08.2018]. National Security Archive, The Iran-Contra Affair 30 Years Later: A Milestone in Post-Truth Politics, URL: https://nsarchive.gwu.edu/briefing-book/iran/2016-11-25/iran-contra-affair-30-years-later-milestone-post-truth-politics [15.08.2017]. Ralph Keyes, The Post-Truth Era: Dishonesty and Deception in Contemporary Life, New York 2004. Colin Crouch, Post-democracy, Cambridge 2004, p. 4. Frank Esser, Tabloidization' of News. A Comparative Analysis of Anglo-American and German Press Journalism, URL: http://journals.sagepub.com/doi/abs/10.1177/0267323199014003001?ssource=mfc&rss=1ss=1 [15.08.2018]. Wendy Brown, American Nightmare: Neoliberalism, Neoconservatism, and De-Democratization, URL: http://journals.sagepub.com/doi/abs/10.1177/0090591706293016 [15.08.2018]. Michael Peter, Education in a post-truth world, URL: https://www.tandfonline.com/doi/full/10.1080/00131857.2016.1264114 [15.08.2018]. Hunt Alcott, Matthew Gentzkow, Social Media and Fake News in the 2016 Election, in: Journal of Economic Perspectives, 31 (2017) 2, pp. 211–236. Aaron Walter, Institutional partisanship, in: Slovak Journal of Political Sciences, 16 (2016) 2, pp. 146-16. Michel Foucault, The Order of Discourse, in: Michael Shapiro (eds. ): Language and Politics, Oxford 1984. David Horwarth, Jacob Torfing (eds. ), Discourse Theory in European Politics: Identity, Policy and Governance, Basingstoke 2005, pp. 316-349. Louise Phillips, Marianne Jorgensen, Discourse Analysis as Theory and Method, London 2002. Roman Chopik, The Slovak Spectator. Kotleba uses American campaign tactics, URL: https://spectator.sme.sk/c/20113860/analysts-kotleba-uses-american-campaign-tactics.html [10.09.2017]. Ines Bhehr I.a., Radicalisation in the digital era, URL: https://www.rand.org/pubs/research_reports/RR453.html [15.08.2017]. COPS, Online Radicalization to Violent Extremism, URL: http://www.theiacp.org/portals/0/pdfs/RadicalizationtoViolentExtremismAwarenessBrief.pdf [27.07.2017]. Ernesto Laclau, Chantal Mouffe, Hegemony and Socialist Strategy: Towards a Radical Democratic Politics, London 1985/2001; Todd C. Helmus, Erin York, Peter Chalk, Promoting Online Voices for Countering Violent Extremism, URL: https://www.rand.org/content/dam/rand/pubs/research_reports/RR100/RR130/RAND_RR130.pdf [15.08.2018]. Libby Lester, Brett Hutchins, Power games: Environmental protest, news media and the Internet, in: Media, Culture & Society, 31 (2009) 4, pp. 579–595. Viera Žúborová, Ingrid Borarosová, The Myth of the Angry Voters: Parliamentary Election in Slovak Republic, URL: http://spr.fsvucm.sk/wp-content/uploads/2015/10/34-48.pdf [11.09.2016]. Benjamin Oreskes, Joseph Schatz, Slovakia Defends Its Closed Doors on Migration, URL: http://www.politico.eu/article/slovakia-closed-doors-migration-refugees-relocation-quota [24.12.2015]. Bartek Pytlas, Radical Right Parties in Central and Eastern Europe: Mainstream Party Competition and Electoral Fortune, New York 2016. Benjamin Cunningham, We Protect Slovakia, URL: http://www.politico.eu/article/slovakia-fico-migrants-refugees-asylum-crisis-smer-election [08.08.2017]. Arlene Robert, Fico: Anti-refugee, pro-Russian headache for the Socialists, URL: https://www.euractiv.com/section/justice-home-affairs/news/robert-fico-anti-refugee-pro-russian-headache-for- the-socialists [02.08.2017]. Clair Sturm, Milan Nič, Solidarity with refugees Is not exclusively reserved for the “West”, URL: http://www.cepolicy.org/publications/solidarity-refugees-not-exclusively-reserved-west [02.08.2017]. European Commission - Public Opinion, Slovakia Is Most Racist, URL: https://www.boredpanda.com/racism-in-the-eu-map-bezzleford [27.09.2017]. Reuters, Slovakia toughens church registration rules to bar Islam, URL: http://www.reuters.com/article/us-slovakia-religion-islam-idUSKBN13P20C [30.11.2016]. Peter Kováč, Extrémizmus na Kotlebovi jeho voliči nevidia (štyri chybné argumenty a ich vysvetlenie), URL: http://domov.sme.sk/c/20113159/extremizmus-na-kotlebovi-jeho-volici-nevidia-styri-chybne-argumenty-a-ich-vysvetlenie.html [09.03.2016]. Aaron Walter: Islamophobia in Eastern Europe: Slovakia and the Politics of Hate, in: Connections. A Journal for Historians and Area Specialists, 22.02.2019, <www.connections.clio-online.net/article/id/artikel-4705>.